This product may take up to 2 weeks before shipping. 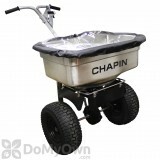 Chapin Professional Salt / Halite / Ice Melt 100 lb Stainless Steel Push Spreader comes with many important features that will make applying ice melt this winter as simple as possible and can spread up to 100 lbs of salt and ice melt at a time. The push spreader's gears and links are made of solid steel and are enclosed in the machinery to better withstand all the changes of the environment, from the cold of winter to the heat of summer. The push spreader's large and elevated gate opens and closes in small steps, while the conical auger and baffle system agitate and spread the product, allowing it to flow smoothly and only go where you want it to go. Another of the spreader's best qualities is that its handle and hopper are made of stainless steel, which makes for sturdy construction that will last for a long time. The hopper is made out of a single piece of steel, without any welds and complete with rolled edges. The Chapin Professional Salt / Halite / Ice Melt 100 lb Stainless Steel Push Spreader also has 14" tires that can handle uneven terrain, making even the worst snowstorms easy to deal with. Made in USA. Outdoor residential and commercial areas. Place the salt or ice melt in the spreader, set the product's settings to the correct levels, then spread the granules on the desired surface. Yes, if followed by directions on label. One piece of solid stainless steel 100 lb hopper without any welds, complete with rolled edges. Large elevated metal grate for better straining and reduces clumping. Enclosed metal gears to withstand the elements. Solid steel linkage opens and closes the gates in incremental steps. Patent pending exclusive salt auger helps agitate product and minimize clumping. Adjustable salt baffle system helps spread salt only where you want it. 14" tires provide stability over uneven terrain. Includes grate and rain cover. There are no questions for this product yet. Ask the first.